I’ve always been a vivid dreamer; in fact, one of my earliest memories is of a recurring dream of being locked outside the house I lived in until I was 5, sitting next to our malamute and staring up at the crescent moon, waiting to be let back in. This recurring dream eventually got replaced by one of our computer freaking out and spitting out gibberish code; I think the idea was that if I didn’t figure it out the house was going to explode. Any possible psychoanalyses of my toddler and middle school self aside, I frequently remember my dreams for hours, if not days or weeks or even years (as seen above). 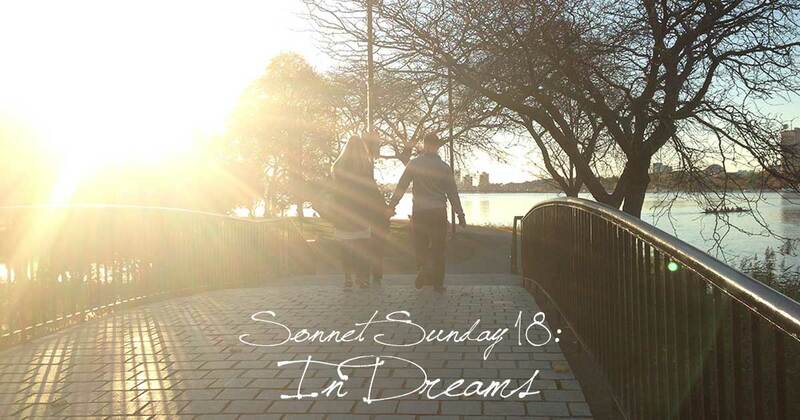 Today’s sonnet is about one of those memorable dreams. The man in this dream was some random composite, not anybody I knew in real life; I do remember dreaming that I was sitting next to him in an empty theater, and he held my hand while he confessed his feelings for me. The memory of the pressure of his hand lingered for hours after I awoke. Of things that happen only in my dreams? This feeling, only known in reveries. And in your dreams do you hold me so dear? When will we meet? I hope the time draws near.